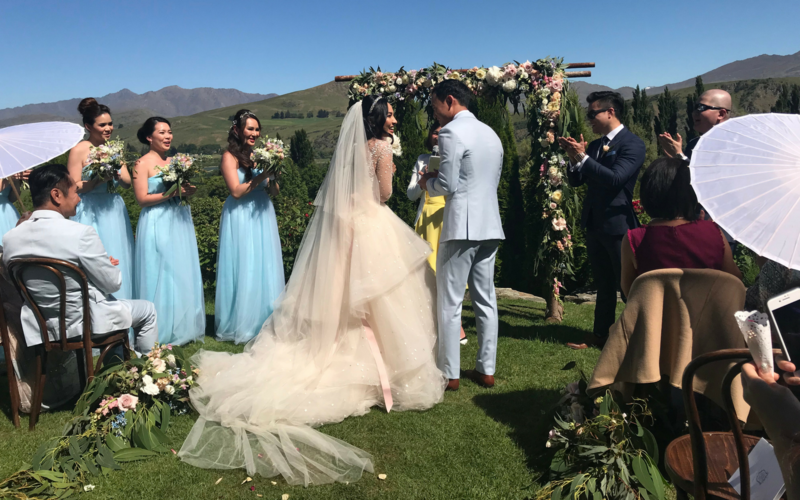 After a surprise proposal on August 2, 2017, Lee Yin Yen and Andrew Kwan finally tied the knot in a spectacular, intimate wedding at the breathtaking Stoneridge Estate in Queenstown, New Zealand. Lending their presence were society guests like Melissa Sin, Chryseis Tan, and Lim May Jian. The #LoveLeeToBeKwan wedding was held over two days, starting with a scenic pre-wedding dinner on November 22, 2017 at Akarua Wines & Kitchen by Artisan, then a picturesque outdoor ceremony the next day, overlooking rolling mountains and blue skies. The bride donned three fairytale gowns, culminating in a gorgeous, finely-embellished white gown with sheer sleeves and a voluminous tiered skirt. The newlyweds hosted a rustic lunch reception of duck liver parfait, poached slipper lobster and Hawkes Bay lamb.